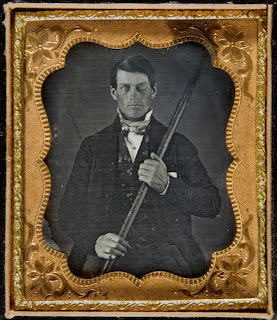 Of all the incredible pieces of history on this page of recently rediscovered photos, the one which really astonished me was the portrait of Phineas Gage, the famous railway worker whose dicing with death via a metal rod and a stack of dynamite was the cause of a revolution in our understanding of the brain. I've no time to write about him now but his story is well worth a read. Photo taken from the above wikipedia site.